Regrouping for live performance in 1999, the hugely influential Wire have ably demonstrated, via sell-out shows everywhere from the royal festival hall to the garage, that their fire still burns some 20 years on from their first angular broadcasts, wowing audiences made up equally of devoted disciples and curious youth, winning resounding critical approval of the “elder statesmen still rock like angry young men” variety. ‘read & burn 01’ is the first phase of a series of new works and stage appearances planned for this year and on into 2003, marking a fierce return to recording for the band, setting a standard that many of today’s new chasers of art-rock’s golden fleece will be hard pressed to emulate, and serving emphatic notice that the gauntlet is down. Committed followers will nod in approval at the sly referencing of elements of earlier material. The kids will be too busy responding to the demands of their adrenal glands as they bounce their heads off walls in unison with the carcrashing dynamism and dogged, unyielding tempos. 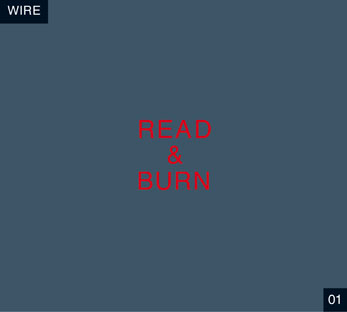 The six tracks of ‘read & burn 01’, each hitting the 3 minute mark with deadeye accuracy, ride the line from punk to rock and back again with nerve-jarring immediacy, dressed and stylishly accessorised with state of the art production values. Which means, in short, loud and clear like the sound of shouting inside your own skull.